PARIS -- Tougher European car-emissions tests being introduced in the wake of the Volkswagen Group scandal are about to bring surprising consequences: bigger engines. Automakers that have spent a decade shrinking engine capacities to meet emissions goals are now being forced into a costly U-turn, industry sources said, as more realistic on-the-road testing exposes deep flaws in their smallest engines. Renault, General Motors and VW are preparing to enlarge or scrap some of their best-selling small car engines over the next three years, the people said. Other manufacturers are expected to follow, with both diesels and gasolines affected. The reversal makes it even harder to meet carbon dioxide targets and will challenge development budgets already stretched by a rush into electric cars and plug-in hybrids. "The techniques we've used to reduce engine capacities will no longer allow us to meet emissions standards," said Alain Raposo, head of powertrain at the Renault-Nissan alliance. "We're reaching the limits of downsizing," he said at the Paris auto show. Renault, VW and GM's Opel all declined to comment on specific engine plans. Alain Raposo: "We're reaching the limits of downsizing." For years, carmakers kept pace with European Union CO2 goals by shrinking engine capacities, while adding turbochargers to make up lost power. Three-cylinder engines below one liter have become common in cars up to VW Golf-sized compacts; some Fiat models run on twin-cylinders. These mini-engines sailed through official lab tests conducted - until now - on rollers at unrealistically moderate temperatures and speeds. Carmakers, regulators and green groups knew that real-world CO2 and nitrogen oxide emissions were much higher, but the discrepancy remained unresolved. 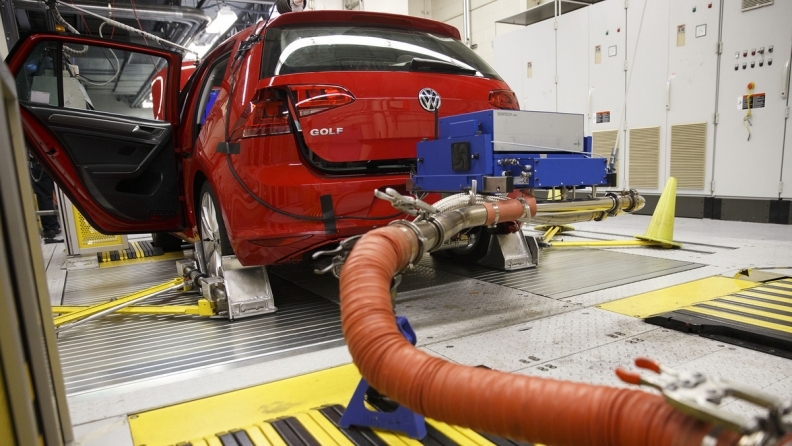 Independent testing in the wake of VW's exposure last year as a U.S. diesel emissions cheat has shed more light on the scale of the problem facing automakers. Carmakers' smallest European engines, when driven at higher loads than current tests allow, far exceed legal emissions levels. Heat from the turbos generates diesel NOx up to 15 times over the limit; gasoline equivalents lose fuel-efficiency and spew fine particles and carbon monoxide. "They might be doing OK in the current European test cycle, but in the real world they are not performing," said Pavan Potluri, an analyst with influential forecaster IHS Automotive. "So there's actually a bit of 'upsizing' going on, particularly in diesel." Carmakers have kept understandably quiet about the scale of the problem or how they plan to address it. But industry sources shared details of a retreat already underway. GM will not replace its current 1.2-liter diesel when the engines are updated on a new architecture arriving in 2019, people with knowledge of the matter said. The smallest engine in the range will be 25-30 percent bigger. VW is replacing its 1.4 liter three-cylinder diesel with a four-cylinder 1.6 liter unit for cars such as the Polo, they said, while Renault is planning a near-10 percent enlargement to its 1.6-liter R9M diesel, which had replaced a 1.9-liter model in 2011. In real-driving conditions, the French carmaker's 0.9-liter gasoline H4Bt injects excess fuel to prevent overheating, resulting in high emissions of unburned hydrocarbons, fine particles and carbon monoxide. Cleaning that up with exhaust technology would be too expensive, sources say, so the three-cylinder will be dropped for a larger successor developing more torque at lower regimes to stay cool. The turnaround on size is a European phenomenon, coinciding with diesel's sharp decline in smaller cars. Larger engines prevalent in North America, China and emerging markets still have room to improve real emissions by shrinking. Fiat, Renault and Opel have the worst real NOx emissions among the newest Euro-6 diesels, according to test data from several countries. They now "face the biggest burden" of compliance costs, brokerage Evercore ISI warned last month. Such reckonings are the inevitable result of on-the-road testing, said Thomas Weber, head of research and development at Mercedes, which has nothing below four cylinders. "It becomes apparent that a small engine is not an advantage," Weber told Reuters. "That's why we didn't jump on the three-cylinder engine trend." The tougher tests may kill diesel engines smaller than 1.5 liters and gasolines below about 1.2 liters, analysts predict. That in turn increases the challenge of meeting CO2 goals, adding urgency to the scramble for electric cars and plug-in hybrids. VW has been far more vocal about ambitious plans announced in June to sell 2-3 million electric cars annually by 2025 - about a quarter of its current vehicle production. "You can't downsize beyond a certain point, so the focus is shifting to a combination of solutions," said Sudeep Kaippalli, a Frost & Sullivan analyst who predicts a plug-in hybrids surge. In future, he said, "downsizing will mean you take a smaller engine and add an electric motor to it."